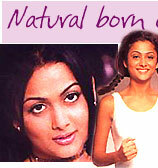 rediff.com, Movies: Amrita Arora: Natural born entertainer! If walking contradictions had a name, it would be Amrita Arora. And no, we're not saying it. The lady in question endorses it herself with a totally effervescent charm. Movies. Masti. Magic. That pretty much sums up Amrita. She's been a popular MTV veejay, enjoyed the resultant fame and adulation. When she thought she was getting overexposed, she took a break from television. Then landed the offer to act in Kitne Door Kitne Paas, opposite Fardeen Khan. She was excited. After all, she had always wanted to act. Now, with the film slated to release early next year, and some others in her kitty, Amrita is loving it all. The acting. The dancing. The romancing. I've always been considered the entertainer in the family, ever since I was a child. I have always loved, still enjoy, nautanki. Everyone assumed I�d carve an excellent career in films. So there has been a natural shift towards films since then. I never considered modelling as a profession -- too tiring. I wanted something more. I love the idea of essaying different characters, being different people. I even love running around trees. I'm passionate about acting and films. Tell us a bit about Kitne Door Kitne Paas. It's my first film. I'm acting opposite Fardeen Khan; the film is directed by Mukul Shah. It�s a magical love story about two people who come together thanks to destiny. There is no parental pressure, no villains. I signed on in the first week of January 2001. We began shooting around January 26. The first schedule, in Bikaner, lasted 12 days. The film is tentatively slated for a January 26, 2002 release. I play a girl studying abroad -- bubbly, vivacious, forthright, with the right Western and Eastern values. How close is your character to the real you? For starters, I didn�t study abroad. But I am pretty bubbly and lively. I live life on my own terms -- but I will never forget the values instilled in me by my parents. I respect Indian culture and tradition, but I am no moral police. How was it working on the sets, your rapport with Fardeen and the film unit? Everyone was extremely supportive, cooperative and encouraging. My first shot was at a police station. I was prepared to emote and dramatise. But the director made sure I didn't have any dialogues to mouth. All I had to do was react to Fardeen�s lines. As soon as I finished, everyone applauded and congratulated me. It was an amazing feeling. I am extremely comfortable with Fardeen. He made it a point to stay in the frame even after he had finished his part so that I could feed off his dialogues. I thought that was extremely sweet of him considering he could have used the time off. Do you see Fardeen's arrest affecting your first release? No, it hasn't occured to me at all. I think it was just a case of bad luck especially at a time when he is doing good work. It isn't something that will affect his popularity or the fate of the film. Because at the end of the day, we are dealing with an intelligent audience. I believe Fardeen will pull through. What according to you are the advantages and disadvantages of being a veejay and an actress? Being a veejay gave me a lot of confidence, allowed me to travel extensively, helped me handle crowds. I was an everyday person. People related to me as a friend. Becoming an actress changed that. People start maintaining a distance. Veejaying also runs the risk of overexposure. I lost out on a lot of work, commercials, etc, because of that. So taking a break from it was a conscious decision. Films, on the other hand, offer you different characters, different looks. Maybe I�ll get back to anchoring some day, after I reinvent myself. What kind of roles would you like to do? I think I'd do complete justice to roles that suit my age and my image. Roles of a conventional romantic heroine. Roles that Julia Roberts, Meg Ryan, Goldie Hawn, Kajol have done. Later, I�d consider more versatile roles, deglamourised roles, even psychotic roles. Working real hard. Hard enough to qualify as number one. With a couple of awards under my belt. And, hopefully, married. What do you think are the problems the industry is facing and how do you propose to deal with them? The only thing that comes to mind right now is link-ups between artistes. Personally, I don�t feel I owe an explanation to anyone -- as long as my family and friends are aware of what I'm doing. I don�t see the need for clarifications or denials. Do you see yourself bringing about any change in the industry? People tend to judge you professionally based on how you conduct yourself personally. They judge you by the quantity of work rather than the quality. I think I�d like to change that. How important is it to have a connection in the industry? Definitely a bonus. If you�re a novice with no connection, you need to be exceptionally talented and just plain lucky. Do you look to Malaika for advice? Malaika and Arbaaz constantly encourage and help me. I discuss a lot with them. So in a sense, Malaika and my mum are my backbone. I have four films on hand: Feroz Nadiadwala's Awara Deewana Pagal with Aftab Shivdasani; and some films with Salman Khan and Govinda. Have you considered an alternative career should your films not work? No. I�ve never really given it a thought. Right now I�m thinking positive, enjoying the adulation, the love, the respect. I have faith in myself. I take each day as it comes. What counts at the end of the day is that I enjoy what I�m doing and am happy doing it.